- This property comes with one dedicated building parking spot and one community parking spot that is first come, first serve. 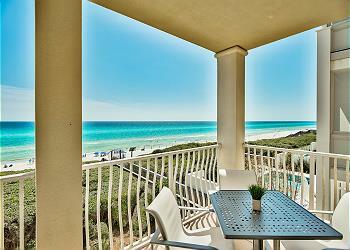 DETAILS: This modern and professionally decorated condo is conveniently located in the heart of Rosemary Beach! Offering three bedrooms, three bathrooms and sleeping arrangements for 8 guests, this home is the perfect location for your next 30A vacation. With stunning finishes and a modern, neutral décor palette, this home offers guests a wonderfully relaxing escape. The entryway features a convenient drop zone which leads to the main living area. An open-concept floorplan allows for a seamless flow between the kitchen, dining, and living rooms. White marble countertops, custom gray cabinetry, and top-of-the-line stainless steel appliances make this entertainer’s kitchen a delightful place to prepare meals. At the wet bar, a sink, wine cooler, and lots of counter space provide the perfect spot for preparing evening cocktails. The adjacent dining area offers seating for six guests, and four additional seats are available at the breakfast bar. Guests will enjoy relaxing in the cozy living area, which features lots of seating, a large mounted flat-screen television, and natural light from the patio’s French doors. Down the hall, a stunning master suite is beautifully furnished with an upholstered king bed, a comfortable chaise lounge chair, and a mounted flat-screen television. The en suite private bathroom offers a large vanity with double sinks, a generously sized soaking tub, and a glass-front shower. Guests in this suite will enjoy the lovely natural light and private balcony. The home’s second bedroom features a beautiful queen bed and a private en suite bathroom with dual sinks, a glass-front shower, and a large soaking tub. Private balcony access and a large, mounted flat-screen television complete this room’s welcoming amenities. The third bedroom offers a comfortable queen bed and a private bathroom with a single vanity and shower/tub combo. In the bunk area, a built-in twin-over-twin bunk bed provides perfect accommodations for the younger guests in your group. This home is ideally situated in the heart of Rosemary. The sparking emerald waters and sugar white sand beach is just short walk away, and guests will enjoy being steps away from everything all the wonderful sights and sounds of Rosemary Beach. Three custom 360 Blue adult beachcruiser bikes offer a wonder way to discover the charm of our 30A coastal towns. Don’t miss out on this amazing home in the heart of Rosemary Beach! Contact 360 Blue today to book this beautiful condo! My friend and I brought our daughters and their two friends (high schoolers) on a long weekend of beach, bike riding and shopping. We all loved Rosemary and our condo! The girls biked all the way to seaside one of the days and we had fun at Baytowne Warf in Miramar. We enjoyed a great lunch at Cowgirl Kitchen upon arrival and amazing food at La Crema one afternoon as well. Loved our comfy beds, gorgeous condo, and drinking coffee and wine on our balcony overlooking Barrett square. 360 Blue gave us great service! Could not have been a better weekend! We are beyond delighted that you all enjoyed your long weekend with us in Rosemary Beach! We agree that this condo is in a perfect location making your getaway stress-free and fun! Thank you for staying with 360 Blue, we hope to see you again very soon! A perfect vacation. Beautiful condo. Really enjoyed it. 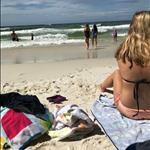 We are so glad that you enjoyed your vacation with us in Rosemary Beach! Thank you for staying with 360 Blue, we hope to see you again soon! Fantastic LD Getaway at Rosemary Beach! Georgetown #303 is stunning and the perfect size for our family and their friends. Beach, food, shopping amazing as usual. I got my Cowgirl Kitchen spicy tuna dip fix! We are so glad that you enjoyed your stay with us in Rosemary Beach! We agree that this condo is the perfect option for a low-key and fun-filled beach getaway! We especially loved the photo you shared! We look forward to seeing you all again soon! We were seeking a late summer family beach getaway and Georgetown #303 worked perfectly for our family of 5. Short walk to the beach and all the amenities that Rosemary and surrounding areas have to offer. This was our first time renting through 360Blue and their team, communications and follow through were all outstanding. Can’t wait for our next trip to 30A!!! We are so glad that you and your family enjoyed your vacation with us in Rosemary Beach! We agree that this condo, as well as the Rosemary Beach Community, are a wonderful option for a fun-filled beach getaway! The family photo you shared is priceless! We are delighted that your experience with the 360 Blue team was a positive one and we hope to host you all again very soon! We had a wonderful trip. Our vacation home was fabulous! It was spacious and beautifully decorated. The kitchen was adequately stocked with essentials. The location was only a short walk to the beach. We loved having the app to refer to during the week. We would definitely recommend this vacation home and hope to be back! We are so delighted to hear how much you enjoyed your vacation with us in Rosemary Beach! 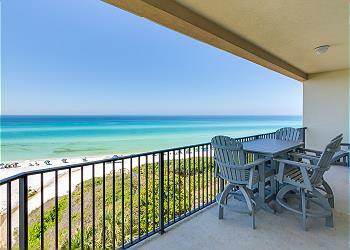 We agree that this condo is in a great location and is perfect for a relaxing beach getaway! We especially loved the gorgeous photo you shared with us. We look forward to seeing you again very soon! 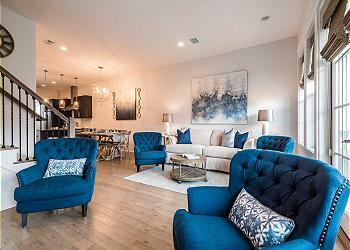 We LOVED our condo at Georgetown #303! It was absolutely beautiful! We had a party of 5 and had more than enough room! We loved the balconies and hung out there daily! We will definitely be back! 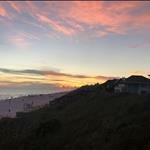 We are so thrilled that you enjoyed your vacation with us in Rosemary Beach! We agree that this condo is perfectly accommodating and is a wonderful option for a relaxing and fun-filled beach getaway! The photo you shared is priceless! We look forward to hosting you and your group again very soon!! Seacrest Beach Villas At Sunset Beach C202 "KYMA"